Top Indian Multi bagger Stock Picks for 2016 | "Blogging by the Road not Taken"
How to find Multi bagger stocks? 2016 was a rough year for Indian equities, with Currency Demonetization, Fed rate hike, Trump presidency, Brexit, year end stabilization of crude oil prices happening all at once, causing massive FII outflows from the Indian stock market. Fortunately 2017 saw big returns and my multi bagger stocks have risen. 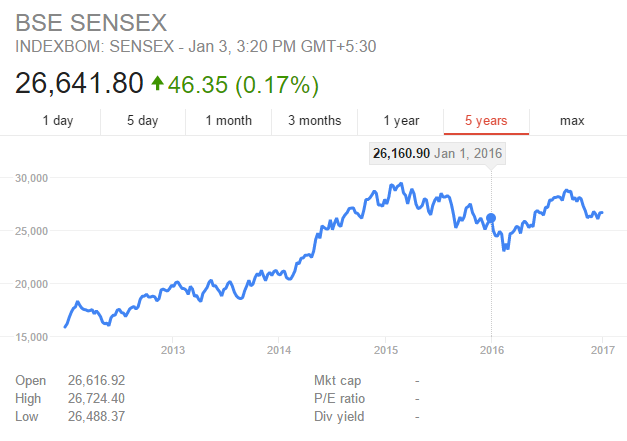 The year saw a good recovery from the Sensex, but a good part of that recovery was destroyed in the year end. Sensex saw over all a good 500 points rise. Simple math will show this impressive number to be nothing more than a 1.8% rise ((26642-26161)/(26161)=1.8%). Updating my blog in 2017, I can reiterate the fact that diversification is the way to invest in the stock markets. Seeking to make a killing with a few big picks may not always work upon your convenience. You never know when the stock will rise. Just like fishing, it is important to stay patient. My own portfolio did not fare too well in 2016. Also because I did a little big value investing towards the end of the year between August-October. Unfortunately, I didn’t have much capital to invest in March when the markets really bottomed out. I still made some good picks capitalizing on some well thought ideas. 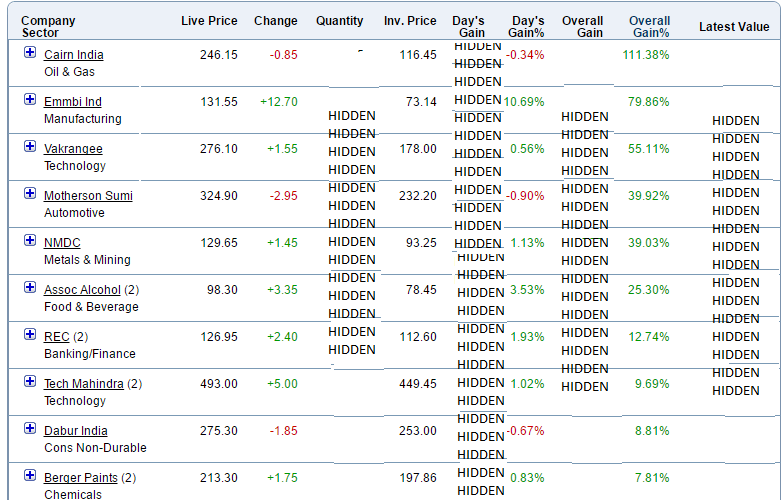 Check my best performing stocks out and I will later explain my rationale in buying them. Oil company affected by low crude oil price. A perfect opportunity to buy is what Warren Buffet said in an interview. So I bought some Cairn India for myself. And it sure has surpassed expectations rather quickly. Maybe to get super rich, I just wait for the next time commodity prices fall and buy in huge quantities. I really don’t see much of the world functioning without oil and metals any time in the near future. Plastic manufacture that has a huge number of products ranging from packaging to water conservation equipment. Considering that they are rely on petroleum as a raw material, this was a diversification bet over crude oil prices. In case of low stable oil prices, this company had to shine as it could make bigger profit margins. Turned out that there more to this company then what I had expected. I actually got introduced to this company from a youtube video. of course I did my analysis well before placing a buy call twice at a good price. If there are scores of rural people heading to Indian banks to make the forced deposit, many would only have access to a Vakrangee center, which is like the last mile link for the Indian rural population to the modern ecosystem. Sales have gone up 3x according to this edelweiss research report. Motherson Sumi and Minda Corporation are familiar to me as I had an opportunity to join one company as an intern during my study at IIT Delhi. I was rejected by Motherson Sumi and welcomed at Minda Corporation. I found Minda to be pretty cool and then I realized that Motherson Sumi was much bigger and had a similar business model as an OEM for Automobiles. So I bought both Minda & Motherson Sumi. Had around 45%+ returns on MS and about 20%+ returns on Minda, but Demonetization took its toll. Just because the world is struggling in optimally organizing itself to create a demand for construction and steel in order to boost iron ore prices again, I hardly think you should miss out an opportunity in buying some good simple cash rich public sector companies that love paying huge dividends. With over 11% dividends paid, NMDC is sure is one gem that was available at the right price at the right moment. I saw that they are responsible for Smirnoff Vodka in India. Considering the increasing female consumption of alcohol in India, the trend towards a healthy Vodka based cocktail will stay for years to come. Here, I invested in the top performing sector for 2015: the Alcoholic Beverages sector. This multi bagger has not disappointed yet in-spite of probation in some Indian states. Thats it for my top stock picks for 2016. These were just the best performing stocks of 2016 and I am sure to find a new list of top performers next year. The important thing is to go for the big long term gains from fundamentally strong companies. One year is often too short to judge a company’s future performance.